The bathroom is more than just a place where you shower. It’s a place where you relax and unwind at the end of the day, particularly if you have a wonderful garden tub. That being said, even if you do just run in and out of your bathroom quickly throughout the day, you want it to look great and give you a relaxing sense. To that effect, I’ve collected 20 amazing DIY bathroom vanities that will help you to transform the bathroom and simplify your beauty routine. Many of these vanities are repurposed furniture pieces. You know how much I love repurposing projects, just take a look at my 40 reclaimed wood projects. I absolutely adore taking an old piece of furniture and turning it into something fresh and new. Many of these bathroom vanities use that concept. From old dressers and desks to cabinets and even a bicycle! You’ll find a vanity in here that is sure to suit every single preference and every single bathroom remodeling project. Most of them have a farmhouse or vintage look, which is really popular right now. If you’re looking for more vintage ideas, be sure to take a look at these 30 vintage DIY projects and for simple diy projects head over our 40 bathroom hacks post. You’re sure to find décor projects that will add even more charm to your new bathroom vanity. 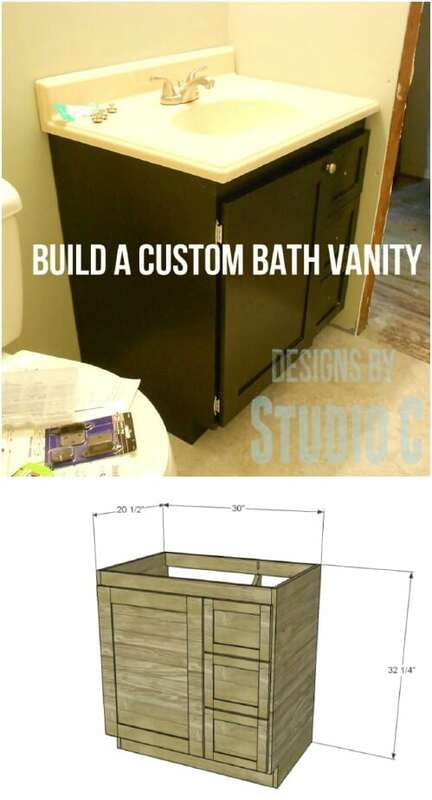 So, without further ado, let’s take a look at some of the most creative DIY bathroom vanities you’ve ever seen. I promise you’ll be surprised and even a little excited to get started building one of these beauties for yourself. If you’re looking for that farmhouse or rustic country theme in the bathroom, this butcher block vanity is perfect. It’s made from posts that you can pick up at a home improvement store, if you don’t have something on hand, that is. The top is a butcher’s block and the underneath is completely open which gives it an airy look and makes the room seem much larger. This is great for smaller bathrooms, if you have a really small bathroom here you’ll find some great ideas to organize every inch. You can use scrap pieces of wood if you have them to create this wooden vanity, that has a great rustic look. The bottom is open for storing towels or you could use cloth baskets and store your basic bathroom necessities under it as well. It’s a relatively easy project that will completely transform your bathroom, and it’s pretty huge so you’ll have loads of storage space underneath. I love this fence board vanity for smaller bathrooms. If you don’t have room for a double sink , this is the perfect cabinet for under your single sink. I should mention that one of the reasons I love it is because of that sink bowl. Those things are so gorgeous! If you’ve taken down a wooden fence lately, you’ll have all the wood you need to get started. You can finish this project in a day’s time and it’s so well worth the work! Ah Pottery Barn – they have the best stuff, don’ t they? Unfortunately they’re a bit too expensive for most of us, which is why we prefer to DIY our own versions of their popular furnishings. This Pottery Barn inspired vanity is a great example. You can build this vanity from scratch and no one will ever know that you didn’t buy it at Pottery Barn, until of course you brag that it was a DIY project. It’s pretty easy and the end result is amazing! 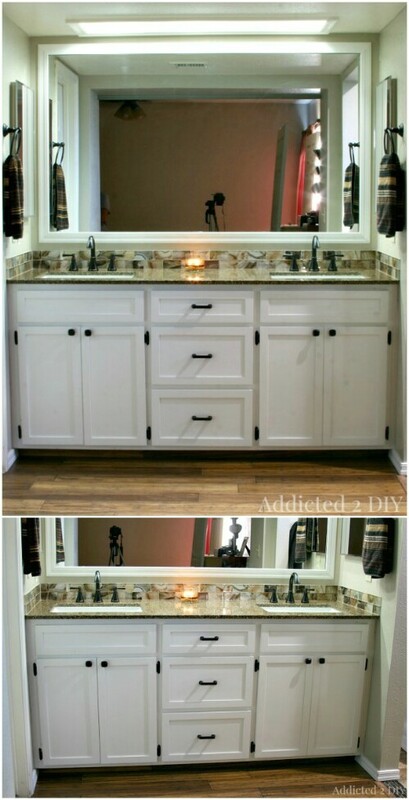 If you have an old dresser that you aren’t using, you can turn it into this gorgeous vanity. Note, this is a small dresser but if you have a double sink, you could also do a larger one and have loads of drawer space for bathroom necessities. This is one of the easiest projects on the list. It won’t take much time or effort and you will absolutely love the results. So, this vanity looks like something that you would buy at Lowe’s or Home Depot for a few hundred bucks. The thing is, you can build it yourself and save a small fortune. It’s not at all difficult and is the perfect choice if you prefer something that looks more traditional. The best part? You can build it in a day and you get to choose the finish, so if you’ve ever had the problem of finding the right vanity at a home improvement store but in the wrong color, you can change all that. You can literally build anything out of anything – this dining table turned bathroom vanity is evidence of that. It’s a great look and a really easy project. Best of all, it’s completely unique. You can bet that none of your neighbors will have the same vanity in their bathroom. Also, you only need one end of the table, so you can use the other end to build a second vanity or create something completely different. Again, here’s to building things out of other things! This old cabinet has been repurposed into an amazing vanity. This is another relatively easy project. If you don’t have an old cabinet that you can use, you can likely find them at thrift stores or flea markets for just a few dollars each. I really love the old rustic look of this one! 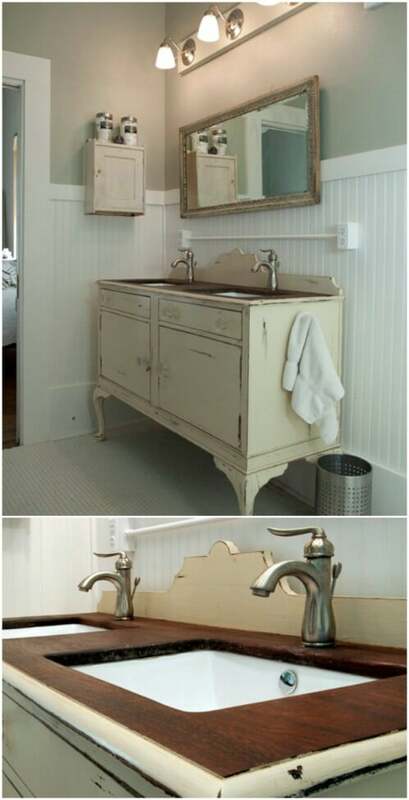 I love the idea of turning an old sewing machine table into a bathroom vanity! How creative is this? You can easily make it and either leave the sewing machine for extra pizazz or turn the bottom of the table into storage for towels and such. I found this little jewel on Etsy and it’s not cheap by any means. If you have an old sewing machine, you could easily transform it for less than $100. This is probably the most unique of the vanities in the list. Imagine an old bicycle holding up your bathroom sink! I love the idea and the look of this whimsical vanity. You can easily turn an old metal bike into a sink cabinet, you just need a few basic tools and some creativity. The basket is even great for holding hand towels! It amazes me the ideas that people come up with for their bathroom remodels! This “floating” vanity is great and so very easy to make. You can have it installed in a day’s time. There are a couple of different ways that you can create a floating vanity, and all of them offer mounds of storage space underneath and give your bathroom a clean, organized look. This is a simple yet elegant vanity that you can easily build from start to finish. If you’re looking for a more traditional look, this is it. You don’t necessarily have to go with gray. If you want another color, just paint it another color, but the overall vanity is easy to create and perfect for smaller bathrooms. Here’s another more traditional take on vanities. This one is for bathrooms with a double sink. It’s also not a standalone vanity like some of the others but it can be if you just toggle the building instructions just a bit. I absolutely adore the counter-top and those faucets are amazing. 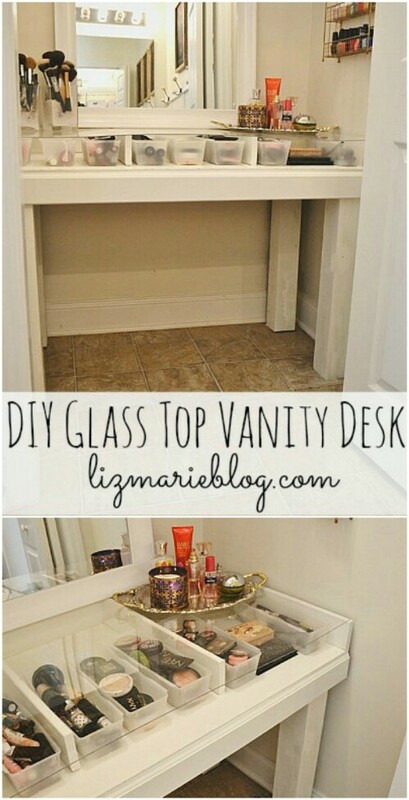 This is great if you have a spot to build the vanity into a corner or nook. 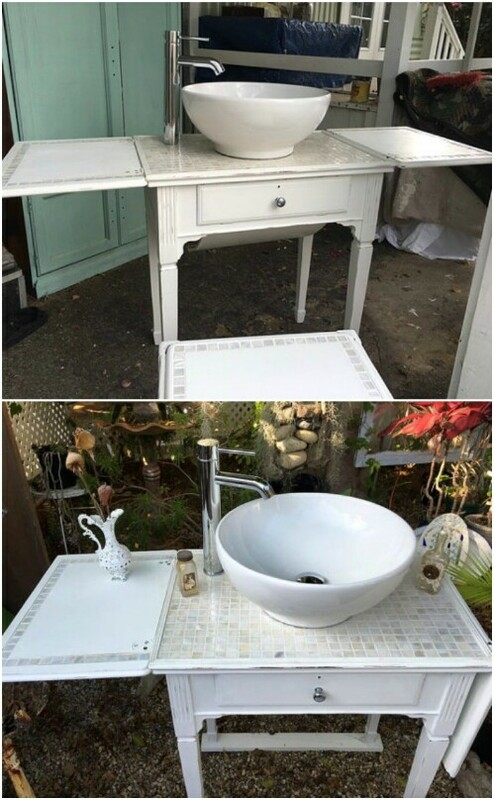 This gorgeous vanity was created from an antique buffet. The overall look is exquisite and there is so much storage room underneath. You could go with a sunken double sink look or if you want to keep the inside of the vanity intact, and give yourself a bit more storage space, you could do bowl sinks, which I think would look great. Add some antique looking finishes and you’re all set. So, this vanity doesn’t hold your sink per se, but it holds your makeup beautifully. It’s got a glass top that you can totally install yourself. You can store makeup in small plastic trays, which you can get like 3 for $1 at the Dollar Store, and the trays slide under the glass top, making everything so organized and clean. I love this table! It’s a great makeup table if you have the extra room in the bathroom. This farmhouse style vanity looks like an antique but it’s really brand new. You can build it yourself and then just add the right paint colors and distressing to make it look like an old cabinet. If you live in an older house or you’re going for that vintage, antique look in the bathroom, this is a great vanity, particularly for smaller rooms. I love repurposing old furniture. This bathroom vanity is repurposed from an old desk and it’s got loads of room for everything. I especially love that seafoam green color, but you could paint it any color that you want. Under the desk is really roomy so you have space for a trash can or to build small shelves to hold bathroom necessities. Plus the drawers would be great for makeup and other smaller items. Again, repurposing furniture can be so much fun and such a rewarding project. This side table turned vanity is great for smaller bathrooms, or you can do two of them if you need double sinks. It’s a really easy project and one that will take less than a day to complete. You can cut out the top for a sink or add a bowl type sink if you want to keep the top intact. You know how much I love working with pallets! 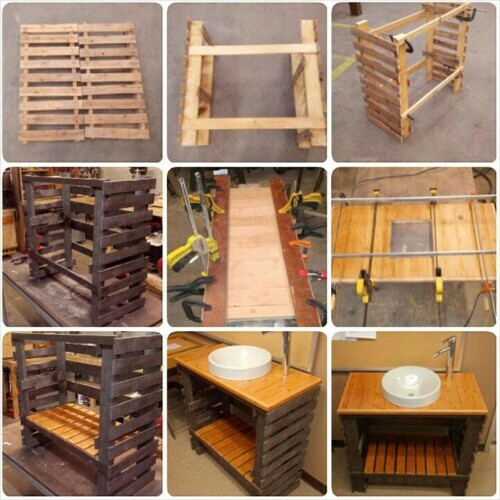 This wooden pallet vanity is the best thing ever. If you’ve got pallets leftover from other projects, this is the perfect new project to use them up. If you don’t have any pallets on hand, you can normally pick them up pretty cheap. There isn’t even that much work involved in building this one, and it’s a great rustic country looking vanity that will instantly spruce up any bathroom. This is a project to transform just the top of your vanity, but it will work with any number of the DIY vanities listed above. You can build this gorgeous wood countertop for less than $40, and just a bit more if you want it large enough to accommodate a double sink. If you’re planning to build your own vanity, this top would be the perfect finishing touch. 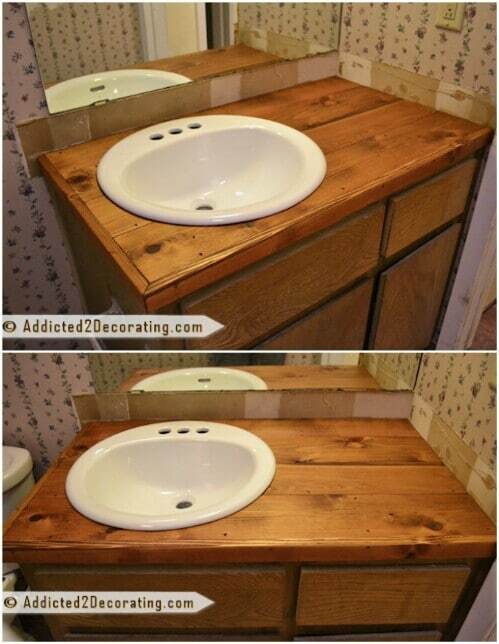 It’s cheap and easy to make and gives the vanity a great rustic look.